Mesosphere is a system that combines a number of components to effectively manage server clustering and highly available deployments on top of an existing operating system layer. Unlike systems like CoreOS, Mesosphere is not a specialized operating system and is instead a set of packages. In this guide, we will go over how to configure a highly available cluster in Mesosphere. This configuration will set us up with failover in case any of our master nodes go down as well as a pool of slave servers to handle the tasks that are scheduled. We will be using Ubuntu 14.04 servers for this guide. Before you complete this guide, it is strongly recommended that you review our introduction to Mesosphere. This is a good way to get familiar with the components that the system is comprised of and assist you in identifying what each unit is responsible for. 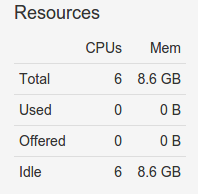 During this tutorial, we will be using six Ubuntu servers. This fulfills the Apache Mesos recommendation of having at least three masters for a production environment. It also provides a pool of three worker or slave servers, which will be assigned work when tasks are sent to the cluster. The six servers we will be using will use zookeeper to keep track of the current leader of the master servers. The Mesos layer, built on top of this, will provide distributed synchronization and resource handling. It is responsible for managing the cluster. Marathon, the cluster's distributed init system, is used to schedule tasks and hand work to the slave servers. Each of these machines should have Ubuntu 14.04 installed. You will want to complete the basic configuration items listed in our Ubuntu 14.04 initial server setup guide. When you are finished with the above steps, continue on with this guide. The first step to getting your cluster up and running is to install the software. Fortunately, the Mesosphere project maintains an Ubuntu repository with up-to-date packages that are easy to install. On all of the hosts (masters and slaves), complete the following steps. Next, you need to install the necessary packages. The components you need will depend on the role of the host. The first thing we are going to do is configure our zookeeper connection info. This is the underlying layer that allows all of our hosts to connect to the correct master servers, so it makes sense to start here. Our master servers will be the only members of our zookeeper cluster, but all of our servers will need some configuration to be able to communicate using the protocol. The file that defines this is /etc/mesos/zk. We need to modify this to point to our three master servers. This is done by replacing localhost with the IP address of our first Mesos master server. We can then add a comma after the port specification and replicate the format to add our second and third masters to the list. The line must start with zk:// and end with /mesos. In between, your master servers' IP addresses and zookeeper ports (2181 by default) are specified. Use this identical entry in each of your masters and slaves. This will help each individual server connect to the correct master servers to communicate with the cluster. On your master servers, we will need to do some additional zookeeper configuration. Delete all of the info in this file and replace it with a single number, from 1 to 255. Each of your master servers must have a unique number. For the sake of simplicity, it is easiest to start at 1 and work your way up. We will be using 1, 2, and 3 for our guide. Save and close the file when you are finished. Do this on each of your master servers. Next, we need to modify our zookeeper configuration file to map our zookeeper IDs to actual hosts. This will ensure that the service can correctly resolve each host from the ID system that it uses. Within this file, you need to map each ID to a host. The host specification will include two ports, the first for communicating with the leader, and the second for handling elections when a new leader is required. The zookeeper servers are identified by "server" followed by a dot and their ID number. Add these same mappings in each of your master servers' configuration files. Save and close each file when you are finished. With that, our zookeeper configuration is complete. We can begin focusing on Mesos and Marathon. Next, we will configure Mesos on the three master servers. These steps should be taken on each of your master servers. First, we need to adjust the quorum necessary to make decisions. This will determine the number of hosts necessary for the cluster to be in a functioning state. The quorum should be set so that over 50 percent of the master members must be present to make decisions. However, we also want to build in some fault tolerance so that if all of our masters are not present, the cluster can still function. We have three masters, so the only setting that satisfies both of these requirements is a quorum of two. 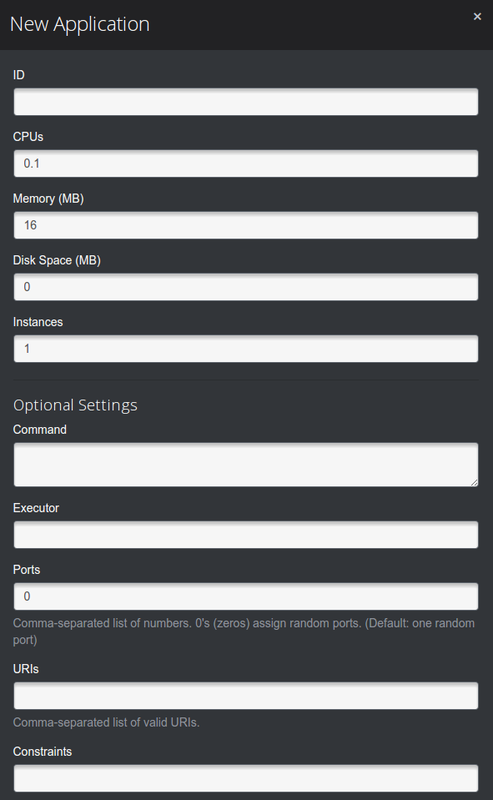 Since the initial configuration assumes a single server setup, the quorum is currently set to one. Save and close the file. Repeat this on each of your master servers. Next, we'll specify the hostname and IP address for each of our master servers. We will be using the IP address for the hostname so that our instances will not have trouble resolving correctly. Do this on each of your master servers. Now that Mesos is configured, we can configure Marathon, Mesosphere's clustered init system implementation. Marathon will run on each of our master hosts, but only the leading master server will be able to actually schedule jobs. The other Marathon instances will transparently proxy requests to the master server. First, we need to set the hostname again for each server's Marathon instance. Again, we will use the IP address, which we already have in a file. We can copy that to the file location we need. This will allow our Marathon service to connect to the Mesos cluster. However, we also want Marathon to store its own state information in zookeeper. For this, we will use the other zookeeper connection file as a base, and just modify the endpoint. This is all we need to do for our Marathon configuration. Next, we will restart our master servers' services to use the settings that we have been configuring. This is a view of your cluster currently. 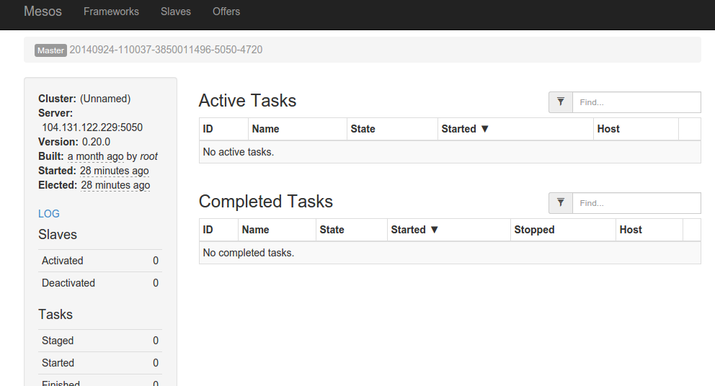 There is not much to see because there are no slave nodes available and no tasks started. We will briefly go over how to use these interfaces once we get our slaves set up. Now that we have our master servers configured, we can begin configuring our slave servers. 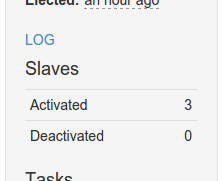 We have already configured our slaves with our masters servers' zookeeper connection information. The slaves themselves do not run their own zookeeper instances. Again, use each slave server's individual IP address for the first command. This will ensure that it is being bound to the correct interface. Do this on each of your slave machines. Marathon is Mesosphere's utility for scheduling long-running tasks. It is easy to think of Marathon as the init system for a Mesosphere cluster because it handles starting and stopping services, scheduling tasks, and making sure applications come back up if they go down. 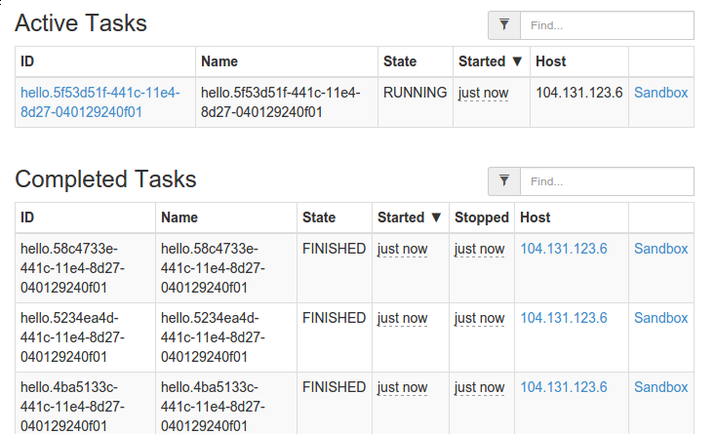 You can add services and tasks to Marathon in a few different ways. We will only be covering basic services. Docker containers will be handled in a future guide. The most straight forward way of getting a service running quickly on the cluster is to add an application through the Marathon web interface. ID: A unique ID selected by the user to identify a process. This can be whatever you'd like, but must be unique. Command: This is the actual command that will be run by Marathon. This is the process that will be monitored and restarted if it fails. We can also submit services through Marathon's API. This involves passing in a JSON object containing all of the fields that the overlay contained. This is a relatively simple process. Again, the only required fields are id for the process identifier and cmd which contains the actual command to run. 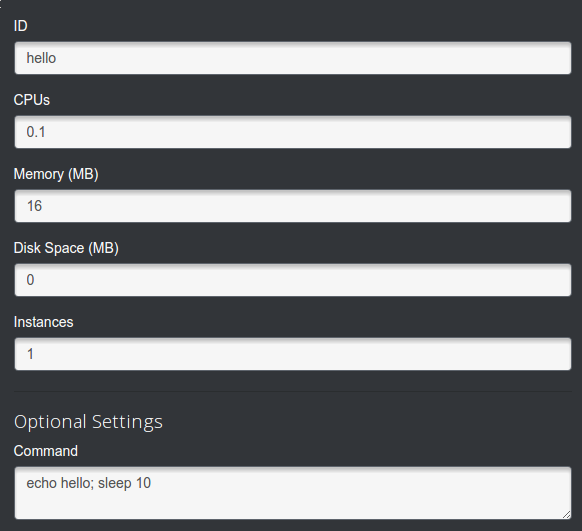 "cmd": "echo hello; sleep 10"
Save and close the JSON file when you are finished. Next, we can submit it using the Marathon API. The target is one of our master's Marathon service at port 8080 and the endpoint is /v2/apps. The data payload is our JSON file, which we can read into curl by using the -d flag with the @ flag to indicate a file. The new service can be monitored and accessed in exactly the same way as the first service. At this point, you should have a production-ready Mesosphere cluster up and running. We have only covered the basic configuration at this point, but you should be able to see the possibilities of leveraging the Mesosphere system. In future guides, we will cover how to deploy Docker containers on your cluster and how to use some of the tools in more depth. Mesosphere is a set of applications that, together, form a cluster management solution for scalable deployments. The Mesosphere components can be installed on most modern Linux distributions, making this system a flexible and powerful option. In this series, we'll introduce you to the basic Mesosphere concepts and components, and show you how to get started using Mesosphere on your own servers. Mesosphere is a software solution that expands upon the cluster management capabilities of Apache Mesos with additional components to provide a new and novel way to manage server infrastructures. In this tutorial, we will briefly explain what each key component of Mesosphere does, starting with Apache Mesos, and show how each is used in the context of Mesosphere.